Air conditioning is one of the most effective and efficient ways to cool or heat space. With modern designs, air conditioners are not only efficient but also look great. We can supply most leading brands of air conditioners, give us a call and we can get your air conditioning job booked in now. A split system air conditioner including installation can cost upwards of $1200 and should last for many years so don’t just trust your investment with anyone. Make sure your Brisbane air conditioning installer is the best of the best. You can do some simple chacks and ask some key questions to make sure you are getting a great installation click here for more information. We have invested in our company in both training and tools to ensure that your split system air conditioning installation is done correctly the first time. Our technicians take pride in there work and will ensure that your air conditioner is working at its peak. When you choose your air conditioner careful consideration has to be paid to the size and type of space you are trying to cool/heat. If you undersize or oversize the unit it will not be effective in cooling/heating the space you have causing increased costs in running and higher maintenance costs over the long term. Contact Just-In Time Electrical to get your room looked at and make sure that your unit is correctly sized. We can supply and install units from 1.7kW for a small bedroom air conditioner to a 8kW for a large lounge and dinning area. So what ever your needs you can be sure that Just-In Time Electrical has an air conditioning solution for you. The brand you choose is a personal choice and is usually based on trust for a specific manufacturer. We stongly recommend Mitsubishi Heavy Industries, why? Glad you asked – we install hundreds of air conditioners around Brisbane each year and have found the Mitsubishi Heavy Industries air conditioners a brand you can trust to work first time every time. The have great after sales service and warrantee which is great to know and rearly needed. We can organise some great pricing with these units through our suppliers. When choosing an air conditioner we only ask that you don’t go cheap because that usually comes back to haunt you. Air conditioning is an investment make sure you choose a great brand and the best installers. Just-In Time Electrical and our technicians are industry leaders in installing split system air conditioning systems in your house or business around Brisbane. We are experts in designing and installing an air conditioning system that will best suit your needs and budget. We can supply most leading brands of air conditioners at very affordable pricing. 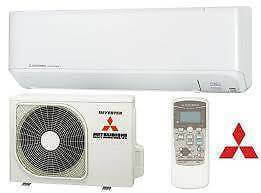 We supply the following air conditioning systems: Mitsubishi Heavy Industries, Mitsubishi Electric, Panasonic, Fujitsu and Kelvinator. If you are not sure of the air conditioning unit you need or want feel free to ask and we will happily point you in the right direction. You can just sit back and enjoy the comfort all year round. Installation of a split system air conditioner is an investment in your house and confort and it is important that you keep it working at it’s peak performance. Preventing issues with your new air conditioner is important. Air conditioners have many parts and many that move. It is important that all these parts are kept at their optimal performance to ensure that your air conditioner keeps operating at its most efficient all year round. We can carry out or schedule an air conditioning service to help keep your air conditioning running hassle free. If your air conditioner has issues we can also be there to help locate the issue and give you advice on the best method of repairing the unit. Air conditioning units that are not serviced regularly cost more to run and create the perfect environment for mould and bacteria, to find out more about air conditioning cleaning click here! Energex offer a rebate for connecting a peaksmart device to your air conditioner – click here for more information.